With the cost of electricity continuing to rise, there is no better time to go solar. But where do you start? We take a look at some important things you need to know before you make the switch. A solar system’s size refers to the total output capacity of the solar panels, measured in Kilowatts (kW). This is how much electricity your solar system can produce in peak conditions. In order to work out what system size is right for your home, you will first need to know how much electricity you use and when you’re using it. If you don’t use much energy during the day (when solar output is peaking) and don’t have a solar battery or premium feed-in tariff, then a small solar system is your best bet. If you do use a lot of energy during the day, then a large system will probably be the better option. If you’re not sure about when you’re using electricity, then as a general rule of thumb, the system size your home will need can be measured by dividing your energy usage by 4. For example, a home with a standard energy use of 16 Kilowatt -hours (kWh) per day will be best off with a 4kW solar system. It’s important to understand that a solar power system (regardless of its size) will be unable to completely cover your daily energy requirements unless you have a sufficiently large solar battery installed, since solar panels obviously can’t operate at night during peak energy consumption periods. Now for the part that everyone is most eager to know – how much will solar cost you? The total price you pay for a solar system and its installation will vary depending on a number of factors, including system size, installer demand, system quality, and more. Below is a guide to what households might expect to pay for a new solar system, not accounting for any incentives you may be eligible for. You might think there are no longer any solar incentives for Australian households to go green. However, while they are much less generous now than they once were, they do still exist. There are two main solar incentives in place: small-scale technology certificates and feed-in tariffs. 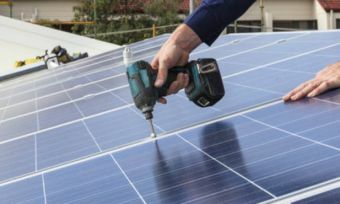 Small-scale technology certificates (STCs): Under the Federal Government’s Solar Credits scheme, eligible customers who install small-scale generation technology, such as rooftop PV solar, are entitled to receive STCs. The number of certificates you receive is calculated depending on the expected output of your solar system over the next 15 years. Customers can use the small generation unit calculator to work out their STC entitlement. As an example, a Melbourne home with a 5kW solar system will receive 88 STCs. These small-scale technology certificates can be bought and sold on an open market in exchange for cash. Alternatively, solar system owners can sell their STCs for a flat rate of $40 per certificate at the STC clearing house. If you don’t want to deal with all this yourself, then some installers may also be willing to sell your STCs on your behalf for a reduced rate. Feed-in tariffs: A feed-in tariff is a rebate for each kWh of unused electricity generated by your rooftop PV solar that is fed back into the energy grid. Feed-in tariff rates vary across the states and between energy retailers, but customers can generally expect to receive a rebate of somewhere between 5c/kWh to 15/kWh. There are sometimes eligibility requirements attached to feed-in tariffs, including maximum system sizes and minimum household energy usage, so check the fine print with your preferred retailer first. Solar batteries have been hailed as a revolutionary device in the energy market, with speculation they may become a household staple in coming years. Electricity storage devices overcome the issue that solar systems can’t be used at night, by storing excess electricity generated in peak periods for use later on. Unfortunately these devices remain quite expensive, with the popular Tesla Powerwall as well as inverter and installation coming to an estimated total cost of $9,500. Whether or not a solar panel is a good financial decision will depend on a range of considerations including solar system size, energy usage and weather. You can see a more detailed assessment of the financial viability of solar storage here. Going solar can definitely save you money so long as you’re careful to choose the right system for you. Fortunately you won’t be expected to figure this all out yourself, as a quality installer will be able to help you identify the best solution for your property. If you need more information on solar, then have a look at our solar panel buying guide.